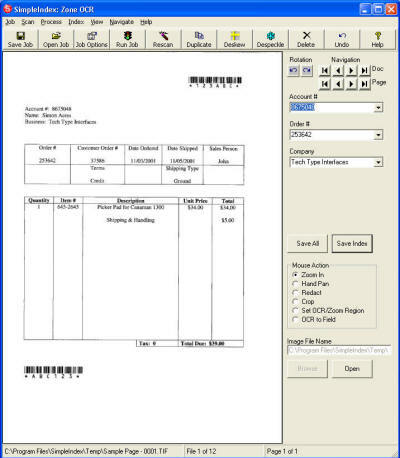 Takes the labor out of document scanning by providing powerful bar code recognition and OCR that can find data anywhere on the page and use it to organize your files automatically. Includes the FineReader OCR engine for the fastest, most accurate optical character recognition available. Create searchable PDF files from scanned images or convert Office documents and HTML files to PDF automatically. Desktop and unattended server processing modes. SimpleIndex Version 7 includes the FineReader OCR engine for the fastest, most accurate optical character recognition available. Create searchable PDF image+hidden text files from scanned images, convert images to MS Word, text or HTML files, or convert Office documents and HTML files to PDF automatically. Other new features include a multi-engine voting bar code recognition, signature capture, real time processing, XML data export, multi-image display during scan and the ability to run multiple jobs at once. Qweas is providing links to SimpleIndex 7.0 as a courtesy, and makes no representations regarding SimpleIndex or any other applications or any information related thereto. Any questions, complaints or claims regarding this application SimpleIndex 7.0 must be directed to the appropriate software vendor. You may click the publisher link of SimpleIndex on the top of this page to get more details about the vendor.